First described in 1965 by Hakim and Adams. A clinical entity consist of the triad of 1) gait disturbance, 2) dementia, and 3) incontinence with normal cerebrospinal fluid (CSF) pressures and radiographic findings of Ventriculomegaly out of proportion to atrophy. NPH is a relatively rare cause of dementia, but identifying NPH is important because it is one of the few treatable entities. 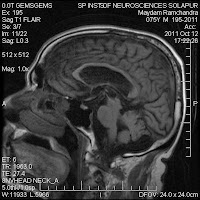 Ventriculomegaly that is out of proportion to cortical atrophy, so called ventriculo sulcal disproportion. This differentiates NPH from age related ex vacuo dilatation of lateral ventricles which is mild and in proportion with atrophy. In NPH, ventriculomegaly is prominent in all three horns of the lateral ventricles, third ventricle with relative sparing of the fourth ventricle. Frontal and occipital periventricular low attenuating areas which may represent transependymal CSF flow may be noted in NPH, but this sign is infrequent and often difficult to differentiate from age related small vessel disease. Ventriculomegaly out of proportion with sulcal atrophy is the hallmark. 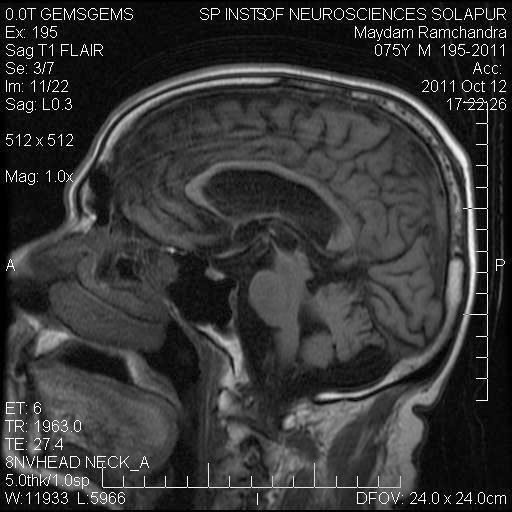 But the MRI in addition to CT provides certain associated or supporting findings to favour NPH. As per Tsunoda and colleagues study, 3-dimensional MRI volume-acquisition techniques can be used to objectively assess ventriculosulcal disproportion. But this volumetric analysis via MRI does not seem to help predict patient response to CSF shunting. As per Jack and coworkers study, the predictive value of 3 MRI findings used with respect to positive response to CSF shunting, these studies included 1) CSF flow void sign, 2) Peri ventricular T2 hyper intensity and 3) Corpus callosal thinning on sagittal sections. CSF flow void sign : On T2-weighted images, moving CSF demonstrate low signal similar to the flow void effects of vascular flow voids, common in cerebral aqueduct and in fourth ventricle seen as a focal absent signal in the Csf pool on T2w images due to jet of turbulent CSF. Peri ventricular T2 hyper intensity : MRI FLAIR may show transependymal seppage of CSF in the form of a periventricular high signal primarily at the tip of frontal horns and occipital horns of the lateral ventricles, can be adequately differentiated from small vessel disease compared to CT.
Copus Callosal thinning : needs sagittal sections for evaluation of corpus callosum. NPH is clinically characterized by triad of ataxia, dementia and incontinence. + Imaging finding which are supportive and include Ventriculomegaly out of proportion with cortical atrophy, Corpus callosal thinning, CSF flow voids, Periventricular ooze of Csf. + Respond to Csf drainage via lumbar puncture.